Descent seems to be barely anthropomorphic: a novel with only one Furry main character, the narrator. Yet this is a novel that any fan of Furry fantasy should enjoy reading. The setting is our world, yet a magical one. Gregory Lombard is first seen caught in a traffic jam. There is powerful magic in this world, and Greg Lombard has been cursed by it. Birmingham, AL, Legion Publishing, August 2010, hardcover $18.99, trade paperback $9.99 (both 390 pages, $5 shipping & handling), Kindle $8.99. Magic has always existed in this world, and among the humans, the Lombard family has excelled at it. The Lombards have been the leaders of the Sorcerer’s Guild for so long as to become a hereditary dynasty. Other supernatural races coexist with humans. Greg is not unique. There is an Internet support group of people who are transforming into rabbits or mice or dogs or horses, or things like gargoyles. Most of the curses are generations old, dating to times when magic was more powerful and unregulated; the results of curses on victims and all their descendants, which the descendants are now suffering. However, the other animal-people are very minor background characters here. Greg’s is one of the few modern curses, which is why not only the Sorcerer’s Guild but the FBI and other present law-enforcement agencies are so interested in his case. For the past nine years Greg has been working undercover, posing as one of the “normal” cursed who is desperate to buy illegal magic in a vain hope of breaking his curse. He has helped to expose some minor, usually solitary unscrupulous sorcerers with paltry magic. Only now, when his shift to rabbithood has gone so far that his fellow Guildmembers and lawmen want him to retire, he gets a lead to organized criminals with powerful spells – maybe connected to those who had cursed him. Greg is determined to go lone wolf if he has to, to take this one last chance to make a real difference even if he cannot cure himself. Fans of Phil Geusz’s fantasies are familiar with his obsession with rabbits. 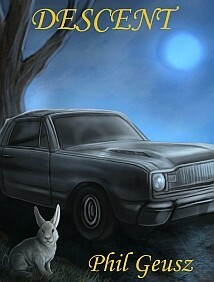 Greg Lombard is a different kind of rabbit-man, one whose adventures shift unexpectedly. At one point they may seem familiar to the fans of urban fantasy noir; of such sorcerous enforcers as Jim Butcher’s Harry Dresden, John Levitt’s Mason (and Lou), Kalayna Price’s Alex Craft, and Patricia Briggs’ Mercy Thompson. Then they become a civil war among the faerie-folk, with the rabbit-man trying to avoid getting trampled underfoot in battles with monsters and basilisks. And finally a World War II-style aerial dogfight between a Dragon and the bunny flying a magically souped-up 1968 Dodge Dart GTS Convertible. Descent is a different kind of adventure; one that would have been at home in the old 1940s Unknown Worlds magazine along with such fantasy classics as Robert A. Heinlein’s The Devil Makes the Law!, L. Sprague de Camp’s Lest Darkness Fall (wiki), L. Ron Hubbard’s Death’s Deputy, Fritz Leiber’s Conjure Wife, and Henry Kuttner’s A Gnome There Was. Don’t miss it!